They painted my deck, one side of my house which is cedar shake siding, and cleaned another side of my house which is also cedar shake siding. "Wockenfuss is excellent! They are very knowledgeable and knew exactly how to deal with the cedar shake siding on my home. 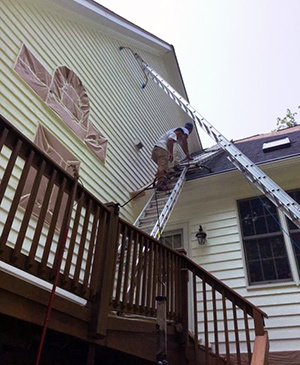 In fact, they are the only company that I would trust to handle the painting and cleaning of my home's exterior. Furthermore, they responded to all of my emails and calls, and they arrived on time." We had our house's 3 story cedar shingle stained. Very good to work with. The color was perfect and they left the extra in case we had to touch up. Very responsive to phone calls. "They called, made an appointment to look at the job before starting. We made an appointment and they were there at the exact time. Finished in one day, no easy feat as we have 3 stories. Pleasant to work with."